This is the feed mill a mile from my floating home in the Skagit Wildlife area. It makes the whole of downtown Conway smell like ‘cream of wheat’ cereal. The whole of it being the Conway Tavern, the tropical fish shop, the old bank building now a private residence, a clothing boutique,two junk shoppes (also known as antique stores) and the post office. Oh, and I forgot the ‘Sons of Norway’ hall is down the street. 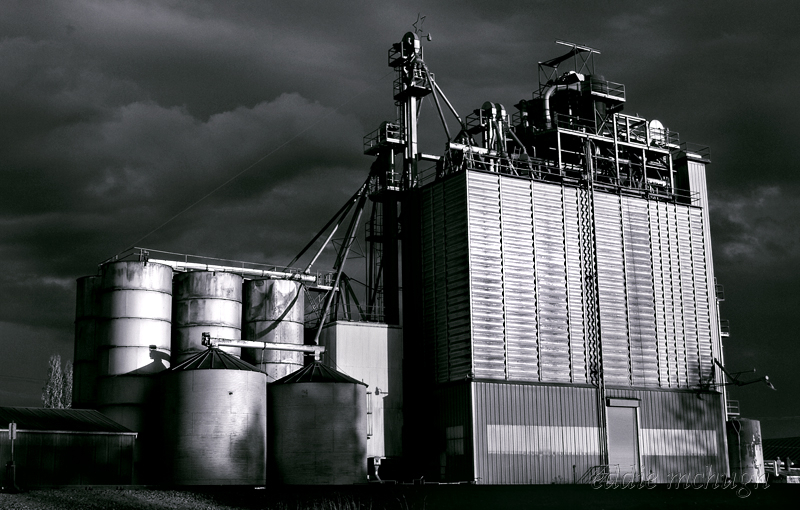 Feed mills make amazing images. You’ve really captured this one well and the processing is superb. I’m going to have to give you a big, fat WOW! for this one. I love the contrast, the foreboding sky and the place. A truly spectacular image! Ah, a shot that goes straight to my heart. It reminds me of my master, Walker Evans. The lighting on the metallic facade and the play with the obscure is fantastic. Great capture and nice post-process. Love the metallic tones and deep dramatic sky. I’ve never seen a Feed Mill before. This is absolutely fantastic!! Amazing light and awesome sky! Stunning shot! Great image, love the contrasts and composition… and then SoF is down the street 🙂 I became a member last year sometime… think I still am too. amazing picture you made here. Superb light and b & W. I’m a big fan of your work!